Now includes a HUD update to control Materials, Glow, Bright and Color. Sim Range. *Where to get it? * At our Second Location at Imaginarium. 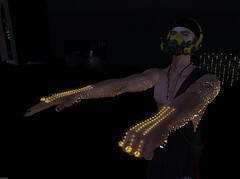 Posted in Animated mesh particles lights, E.V.E Studio, News, Sale, Second Life, wardrobe and accessoriesTagged Dystopia Ed., E.V.E Studio, eye of the storm, jewelry set, pearls, Sakura, sale-a-palooza, SalesBookmark the permalink.